As with a lot of things, when you have been around test equipment for a long time and new equipment with new features evolve over time, you might forget how things used to be as you come to take the modern stuff for granted. Displaying more than one channel's trace at a time is a good example. 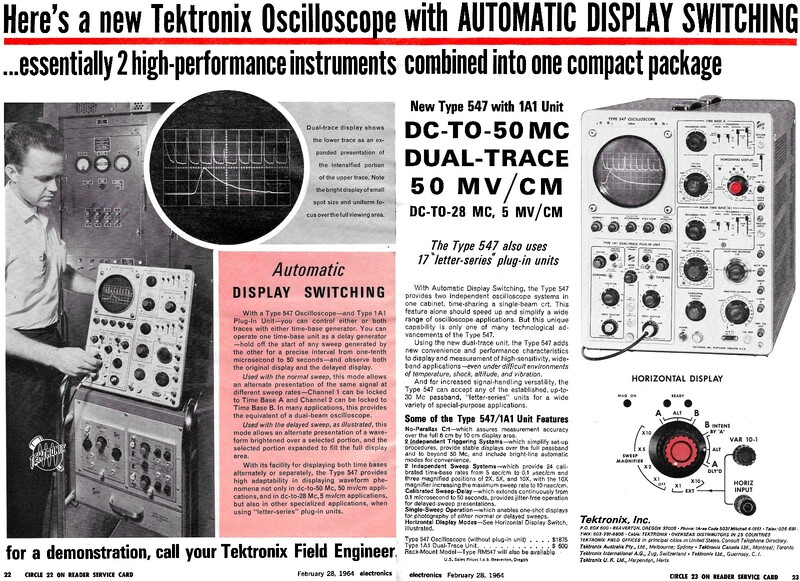 When Tektronix introduced the "Automated Display Switching" feature on their model 547 oscilloscope with the 1A1 time base plug-in, its ability to show two sweeps simultaneously was ground-breaking. Prior to that, the user needed to manually switch between input time base units to get the waveform displayed. 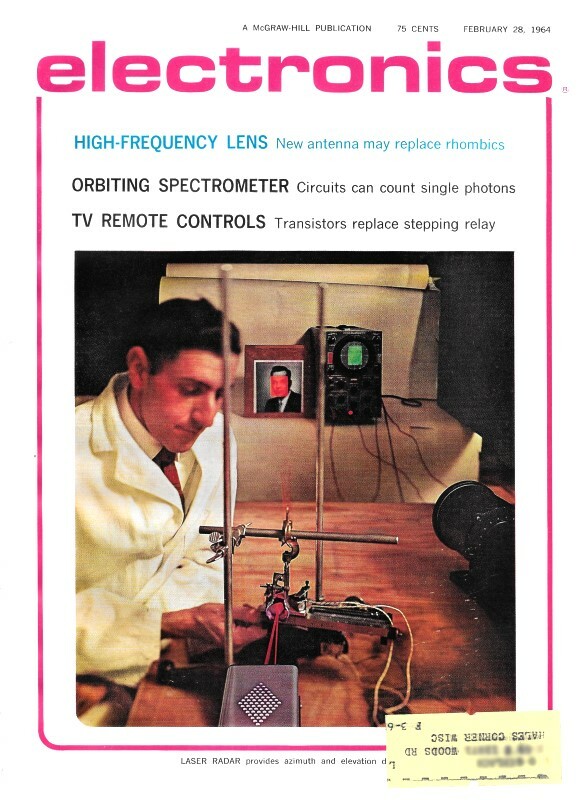 Monitoring two waveforms at a time required separate oscilloscopes, which, given the massive size of their vacuum tube-based electronics, meant occupying a lot of lab space. 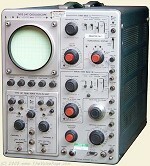 Compare that with the Signstek DSO203 Pocket Portable 8 MHz Digital Oscilloscope shown above. Dual-trace display shows the lower trace as an expanded presentation of the intensified portion of the upper trace. Note the bright display of small spot size and uniform focus over the full viewing area. With a Type 547 Oscilloscope - and Type 1A1 Plug-In Unit - you can control either or both traces with either time-base generator. You can operate one time-base unit as a delay generator - hold off the start of any sweep generated by the other for a precise interval from one-tenth microsecond to 50 seconds - and observe both the original display and the delayed display. Used with the normal sweep, this mode allows an alternate presentation of the same signal at different sweep rates - Channel 1 can be locked to Time Base A and Channel 2 can be locked to Time Base B. In many applications, this provides the equivalent of a dual-beam oscilloscope. Used with the delayed sweep, as illustrated, this mode allows an alternate presentation of a waveform brightened over a selected portion, and the selected portion expanded to fill the full display area. With its facility for displaying both time bases alternately or separately, the Type 547 provides high adaptability in displaying waveform phenomena not only in dc-to-50 Mc, 50 mv/cm applications, and in dc-to-28 Mc, 5 mv/cm applications, but also in other specialized applications, when using "letter-series" plug-in units. 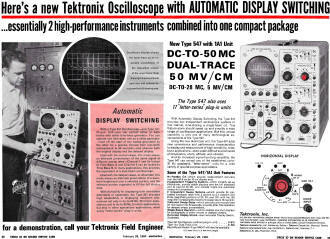 For a demonstration, call your Tektronix Field Engineer. With Automatic Display Switching, the Type 547 provides two independent oscilloscope systems in one cabinet, time-sharing a single-beam crt. This feature alone should speed up and simplify a wide range of oscilloscope applications. But this unique capability is only one of many technological advancements of the Type 547. Using the new dual-trace unit, the Type 547 adds new convenience and performance characteristics to display and measurement of high-sensitivity, wideband applications - even under difficult environments of temperature, shock, altitude, and vibration. And for increased signal-handling versatility, the Type 547 can accept any of the established, up-to-30 Mc passband, "letter-series" units for a wide variety of special-purpose applications. No-Parallax Crt - which assures measurement accuracy over the full 6 cm by 10 cm display area. 2 Independent Triggering Systems - which simplify set-up procedures, provide stable displays over the full passband and to beyond 50 Mc, and include bright-line automatic modes for- convenience. 2 Independent Sweep Systems - which provide 24 calibrated time-base rates from 5 sec/cm to 0.1 μsec/cm and three magnified positions of 2X, 5X, and 10X, with the 10X magnifier increasing the maximum sweep rate to 10 nsec/cm. Calibrated Sweep-Delay - which extends continuously from 0.1 microsecond to 50 seconds, provides jitter-free operation for delayed-sweep presentations. Single-Sweep Operation - which enables one-shot displays for photography of either normal or delayed sweeps. Horizontal Display Modes - See Horizontal Display Switch, illustrated.